As some of my readers have pointed out, I may have appeared somewhat biased against Japan because I did not fully account for other dynamics of the regional naval competition. However, it is not my intention in any way to accuse Japan or its neighbors of espousing expansionist tendencies. I should, therefore, point out that the factors behind the ongoing naval race may be more complex than they appear at first. First, it should be noted that Japan’s 4.68 trillion yen budget ($46.4 billion) pales incomparison to China’s raw defense budget of $166 billion. Though Japan’s recent 40 billion yen ($410 million) increase in its defense budget has been construed by some in neighboring states as part of Prime Minister Shinzo Abe’s hawkish agenda, Japan’s defense budget is relatively modestwhen compared to that of China’s, and hence, insufficient to tip the regional security balance in their favor. 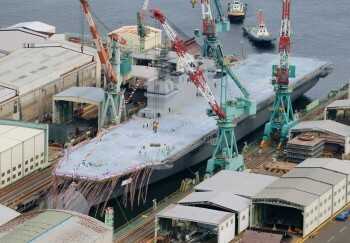 That said, the launching of Japan’s newest ship has provoked controversy over what kind of ship the Izumo really is. Whether the Izumo is a STOBAR (Short-Take-Off But Arrested Recovery), VSTOL (Vertical Short Take-Off and Landing), or CATOBAR (Catapult-Assisted Take-Off But Arrested Recovery) type “aircraft carrier” hardly matters. The reason why some of Japan’s neighbors are upset about the Izumo is the fear that Japan may eventually field an F-35B squadron on the ship. In short, it is not Japan’s current capabilities that are provoking uneasiness, but its future naval might. Indeed, Beijing and Seoul have accused Abe of attempting to repeal the war-renunciation clause within the existing constitution in favor of the “establishment of an army, navy and air force in name.” But both China and South Korea (the Republic of Korea or ROK) share blame for upping the ante for the ongoing naval race. Not to be left out, the ROK Navy has become a great regional naval power in itself. Like the Japanese Maritime Self-Defense Force, the ROKN also fields an amphibious assault ship, the Dokdo, with a 653 feet-long (199 meters) flight deck. It should be noted that the ship, whichcan supposedly deploy a Marine infantry battalion for any contingencies as they arise, is named after disputed islands claimed by both the ROK and Japan. 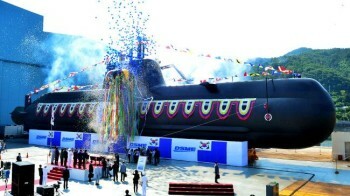 Moreover, the ROKN hassteadily increased its submarine fleet in response to the growing asymmetric threats emanating from North Korea and Japan’s alleged expansionist tendencies. While it may be easy to suppose the three East Asian naval powers may be harboring expansionist tendencies, it may also be the case that each is looking to defend its own interests. Indeed, if we trace the origins of this naval race, we can discern that defense budget increases—or for that matter, acquisition of improved capabilities—by the three East Asian countries were reactions to perceived threats posed by their rivals’ attempts to rearm themselves. Thus, the three states can and should adopt “trust building” diplomatic measures to avert a disastrous regional war. Considering the obvious distrust that pervades among the three East Asian naval powers, it is not difficult to understand why I have previously argued that taming the East Asian naval race may require America’s continued diplomatic presence as a disinterested mediator. The United States can no longer afford to appear inflexible in the face of fluid geostrategic dynamics and unrelenting sequestration cuts. Nor can it afford to alienate China by implementing “pivot to Asia” strategy. Not only that, but “leading from behind” to tame the ongoing East Asian naval race just may be the most cost effective way in which to exercise influence in the region. But most importantly, through this newfound role as peacemaker, the United States can set an example as a peace-loving democratic nation committed to promoting good will within East Asia and to the rest of the world.